“Dunkirk” is a technical marvel, but Christopher Nolan’s ambitions run deeper. Abandoning the familiar language of most war and action movies, this is the tightest, most confident, most intense, and in many ways most idiosyncratic of Nolan’s films, and it’s all the better for it. But what will be most surprising to audiences is that while you’re fully engaged in the IMAX-sized set pieces that sometimes make you forget to breathe, “Dunkirk” blossoms in your mind’s eye, a new kind of film that can only makes complete sense within the infinite canvas of your consciousness. And in a trick that almost sounds like the plot of “Inception,” Nolan accomplishes this without you noticing it’s even really happening. “Dunkirk” starts by working on your senses. The same way that driving over train tracks reverberates through your entire body as you bump around the road, your stomach may drop as a plane banks hard left—this is one of the most visually and aurally immersive movies in years. Wide shots zoom forward through the sky and cut to the claustrophobic cockpits inside a Spitfire fighter plane. Speeding through space, the metal rattling and the engine roaring, the pilot’s face is framed as a six-story tableau. On the ground, an IMAX camera has apparently been welded onto a stretcher, a massive GoPro, vibrating to the frantic motion of being carried. Sequences like these elicit a powerful somatic response, triggering mirror neurons to intensely push us into the present. We’re there. That feeling doesn’t stop. An overwhelming sensory experience has always been an end unto itself for Nolan, and the visual storytelling is so strong and built on what Hitchcock called “pure cinematics,” you’d be tempted to call it a silent film if it wasn’t the loudest movie of 2017. But the first-person images and subjective sound design also double as a human scale entry point into the macro-level processes of war. Recalling a line from another Nolan film, “Batman Begins,” “It’s not who you are underneath. It’s what you do that defines you,” Nolan carries that idea into “Dunkirk” like a mantra. It’s only through the A to B of how these men try to survive that we understand them, and we see shades of heroism and cowardice across the broad canvas. Big sounds and gorgeous images immerse us in the moment, and the screws of suspense get turned as choice and process intersect. Tom Hardy’s spitfire pilot Farrier struggles to aim through his narrow viewfinder, not because he’s a bad pilot—he’s one of the best—but because it takes tremendous skill to make a kill at tremendous speed. Fuel is precious, and we watch him weigh whether to decrease fly time and attack with speed from above, or conserve fuel and fly longer. Finally, in what reveals itself as “Dunkirk”’s climax, Farrier makes his choice and flies a Spitfire running on empty into the hands of German troops—a sacrificial savior, evoking the same selfless moral sensitivity as a superhero like the one immortalized in Nolan’s The Dark Knight Trilogy. Conversely, in a sequence reminiscent of Lang’s morally investigative “M,” Harry Styles’ Alex leads a witch-hunt targeting an imposter inside a landlocked boat taking fire. They wait for the tide to wash the boat to safety, a process that either takes three hours or six—they aren’t sure—but as the hull takes fire they grow desperate. One of them, it seems, must flee the boat to lighten the load so more may live. It is revealed that a French soldier named Gibson (Anuerin Barnard) stole a British Uniform to escape the beach, and in terror and paranoia, Alex turns guns on Gibson to force him off the vessel and to his death. Gibson and Alex are separated by nationality and politics, but as in Clouzot’s “The Wages of Fear,” none of that matters if you’re not still breathing. Presented without judgment, the manner of how things get done—such as the steps of getting a boat off to sea—inform the choices these men make to survive. Consequently, no war film has ever been so concerned with the behavioral arithmetic of a war zone. Each tiny decision has an action and reaction, cause and effect, and Nolan is fascinated in how those small processes add up to the salvation of hundreds of thousands of men. And this is where Nolan declares his own version of the “Dunkirk Spirit” itself, wherein our existential survival instinct as a species overwhelms the selfishness of self-preservation (brought to life by Farrier’s sacrifice especially). Not many movies try to balance the extreme intimacy of the individual with an almost abstract notion of “species”—there have been examples, notably two of Nolan’s favorites, Terrence Malick’s “The Thin Red Line” and Stanley Kubrick’s “2001: A Space Odyssey”—but for Nolan these ideas are the counterweights that hold the movie together. 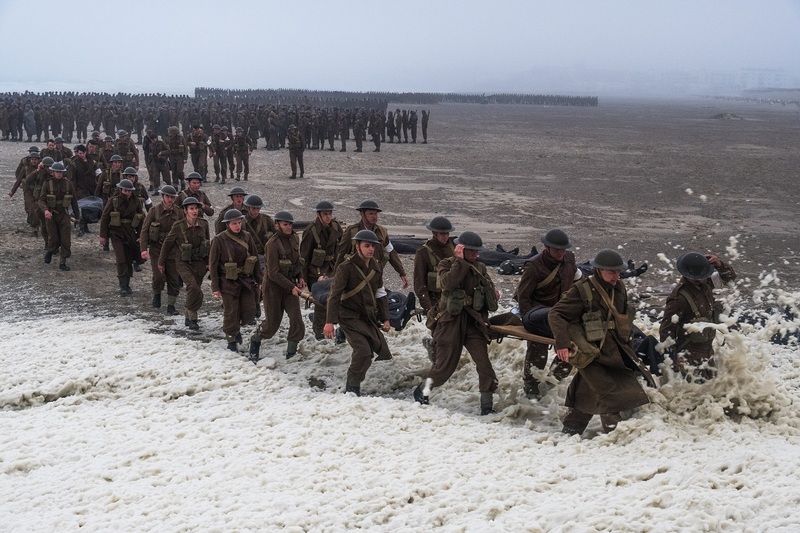 All of this works through “Dunkirk”’s innovative time-thawing structure (something only Nolan’s would think of, let alone execute), and it’s from that structure that “Dunkirk” can ultimate manifest, or blossom, in our mind’s eye. Constructed as a tightly wound ticking clock across three distinct stories— land, air, and sea—“Dunkirk”’s structure has them running at different speeds and they collapse into each other like waves on the surf. The most daring aspect of “Dunkirk” is only understood through the broader context of everything else the movie is doing. Always a defining character and often an enemy, time is an integral part of each Nolan film, this one most of all. “Dunkirk” slowly melts multiple experiences of different people in different times into single impressionistic moments. A striking example comes when Nolan cuts to day, to night, and back to day again, wherein we meet two contrasting soldiers. One is kind, the other dangerous. We’re introduced to one of them as Mark Rylance’s sailboat captain rescues a shell-shocked soldier adrift at sea, the victim of a U-Boat torpedo. Overcome with emotion, he attacks Rylance’s crew and inadvertently murders a boy (Barry Keoghan). Soon after, we meet the second soldier at night, gently escorting the victims of another U-Boat torpedo back to shore. Through the poetic irony of “Dunkirk”’s structure, these two soldiers are actually the same man: Cillian Murphy’s “shivering soldier.” Before the trauma, and after. Nolan challenges our point of empathy as we experience contradictory emotions simultaneously; should we feel equal sensitivity towards heroes and cowards alike? So much of “Dunkirk” only makes complete sense in abstract, as an experimental art film rather than a Hollywood blockbuster, that it might’ve come with the warning “some assembly required.” But it doesn’t need to, and that’s the trick to Nolan’s mind heist. In the same way that dreams are created and perceived simultaneously in “Inception,” Nolan shows us how to watch “Dunkirk” while we watch. Cowards and heroes, sailboats and spitfires, species and a solitary soldier, all start to blend together as one. Time moves forward, back and side to side, a symphonic ballet of movement and memory that repeats itself like notes in a melody. Scenes are seen multiple times across multiple timelines, often in fleeting glimpses, but converge dramatically around a ship out at sea, a Minesweeper. First, we see it bombed from above, explosions ringing out. Many have died instantly. A few minutes later in our future, which is the ship’s past, the Minesweeper departs Dunkirk Beach, where dozens of soldiers celebrate the arrival of the little ships to the rescue of 300,000 British Troops (the finale!). 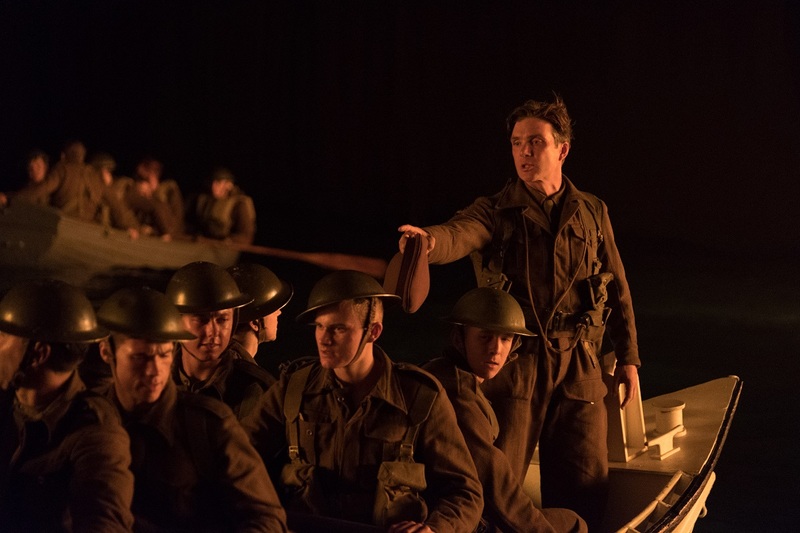 The same soldiers who, in their future, which is now our past, both laterally experienced in our present, are bombed and then saved by Rylance’s boat captain. This construction bears most obvious resemblance to a particular structure that has already been featured in one other Nolan film: The Tesseract. A tesseract, a multi-dimensional cube where the area of each cube is multiplied into isolated cells that are both the same and different from one another, is a complex structure that’s almost impossible to visualize because it’s an abstract, quantum object. It was beautifully brought to life in “Interstellar,” however, as a physical object, perceived by Matthew McConaughey’s good ol’ boy astronaut Cooper, floating beyond time and space. There, the tesseract was the bedroom of Cooper’s daughter, where each “cube” is a variation of everything that has ever happened or ever will happen inside that room; “Dunkirk” does the same thing with the sand, air, and sea of Dunkirk beach. But instead of depicting it pictorially, he uses our minds. Within this mind-tesseract, constructs like past, present and future derive meaning from us as viewers and objective observers, rather than through Tommy, Alex or Farrier, who are forever trapped in the present of their “cells,” where their past or their future do not apply. It’s an irony that it took a tale already set in our reality for Nolan to truly embrace the uncanny and the metaphysical. Seemingly tired of the physical, concrete limitations storytelling has in our shared reality, Nolan journeyed to a new frontier, one where time is elastic, where subjectivity and objectivity are free to trade places, and time is an elusive structure. Hence, in “Dunkirk,” it’s we, the audience, who mirror Cooper’s journey through the tesseract. Turning our minds into a cosmic canvas to ponder about species, survival and relative time, “Dunkirk” can often feel more otherworldly (or even science-fiction) than “Interstellar." Beneath the artifice of authenticity, the aesthetic is that way, too. Gunfire hits like the cracked whips of hell, aerial battle sequences nearly induce vertigo across surreal alien skies, and­ the English Channel doubles as a black hole beneath the sea. “Dunkirk” is an eldritch masterpiece, using the howl of dive bombers the same way H.P. Lovecraft would tease tentacles and madness. It’s only in Nolan’s strict and fetishized literalism that he could finally discover what his entire career has been building towards: a tesseract-simulacrum of hyper-reality and ecstatic truths, packed tightly into the thrilling veneer of a major summer tentpole.